Code to FlowChart is widely used in software development and project documentation. It can help software developer or document writer to convert source code to flow charts automatically. It understands and improves your algorithms on software developing. By using Code to FlowChart, you can easily know the structure of unfamiliar source code. More than that, you can solve some very complex bugs by the flow chart and NS chart. Code to FlowChart is an advanced source code to flowchart converter for software developers. It can automatically generate flow chart/NS chart from source code, and helps users to understand complex program structures by visual diagrams. Code to FlowChart reverse engineers your source code into high-quality flow charts or UML Activity Diagrams. Code to FlowChart analyzes programming statements, loops, to build up a flowchart from the source code. 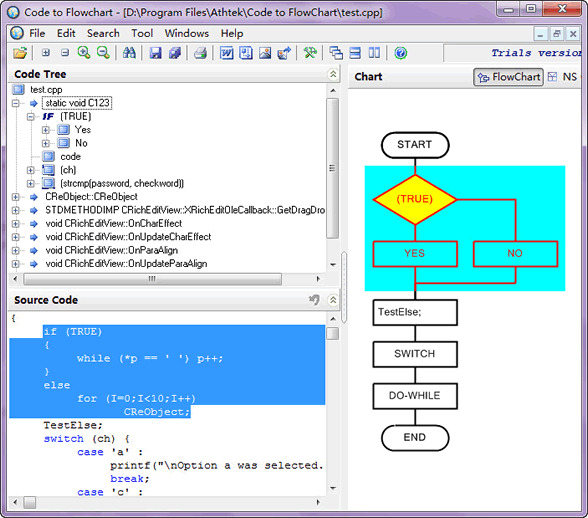 The Flowchart is based on the imported programming project files. Double click on the logical boxes, the flowchart will be fully shrunk or expanded as you like. Especially, Code to FlowChart allows generating flowchart from source code segment. This is very useful in locating logical errors or extra codes when the user is verifying a huge amount of source codes. No manual drawing is required. Code to FlowChart is a helpful programming assistant in many practical works. It supports C, C++, VC++ and Pascal/Delphi. You can easily add flow charts to your project documentation by using Code to FlowChart. All Charts can be exported to MS Word, VISIO, XML, Bitmap and SVG files. Click any logical block on the flowchart, the corresponding source code will be highlighted. This is very useful for document writers. By using Code to FlowChart, programmers are free to get project overview, browsing and navigation. It is a handy assistant for both senior and junior programmers. In one word, Code to FlowChart is the first choice for you to let code visual!